The latest cold snap has caused further disruption to pre-season preparations and improvements at the Media Prima Arena. 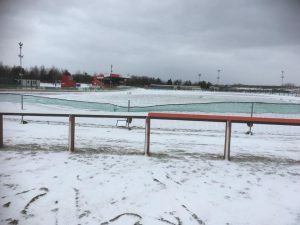 Promoter and labourer Kevin Keay attended the snow bound track today to find large sections of boundary fencing had collapsed under the weight of snow drifts and strong winds and sections of the safety fence had also been damaged. It’s a case of one small step forward and two larger ones backwards at the moment and we are getting a little frustrated at the lack of progress but even the BSPA can’t control the weather so we will just have knuckle down and do what we can till we get a dry settled spell of weather. Meanwhile co-promoter Jitendra Duffill has completed his line up for the opening meeting, an individual meeting in memory of Julie Lewis, a stalwart member of staff on Teesside for many years. The full line up will be revealed later this week.